Irish Ayes is a 70c Viking yacht based in West Palm Beach, Florida. 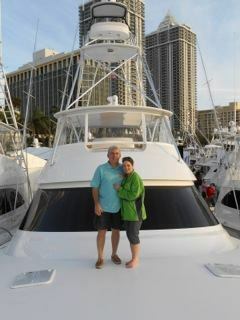 Owners Mike and Cindy Poole, along with the crew, want guests to have a great time aboard Irish Ayes. This website is a single location for everything you’ll need before, during, and after your trip. Access everything from itineraries to touring information to photos/videos and even find a place to track the Irish Ayes Royal Slam, and the boat’s travel calendar. To view additional content, please click on Login to enter your pre-assigned username and password. If you wish to request access, please contact april@irish-ayesfishing.com.